Note : For 16 years old and above. 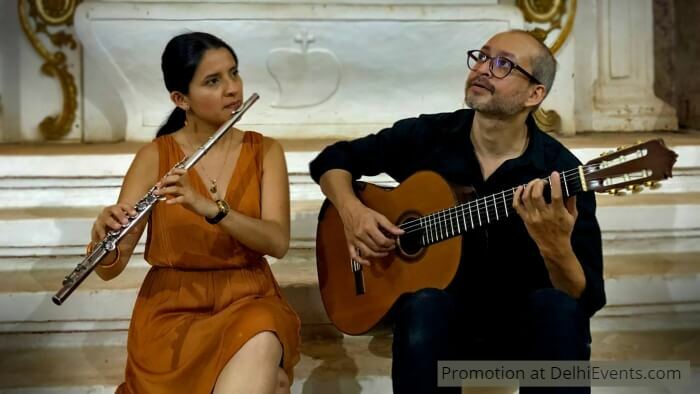 A night that intertwines stories with song - Classical and Contemporary music from Europe and the Americas is paired with the stories that lie behind their creation. Two artists with diverse training and influences come together to present an evening of culturally rich melodies. For Mexican flautist Nathalie Ramirez, her interest in Hindustani Classical Music brought her to India. She has learned Hindustani vocals and the Indian Bansuri (bamboo flute) in tandem with the traverse flute. Conversely, Shyamant Behal learned the Classical Guitar while in Delhi and went to France to deepen his training in the instrument. While in France his sensibilities drew him toward the sub-cultures of South America. Watch these anecdotes of musical heritage told mostly through melody interspersed with a few words.